It's such a happy, sunny day here. I hope it's much the same wherever you are. Thanks so much for visiting today - I have in store for you a very simple and fun card, with a few techniques I've been loving lately. 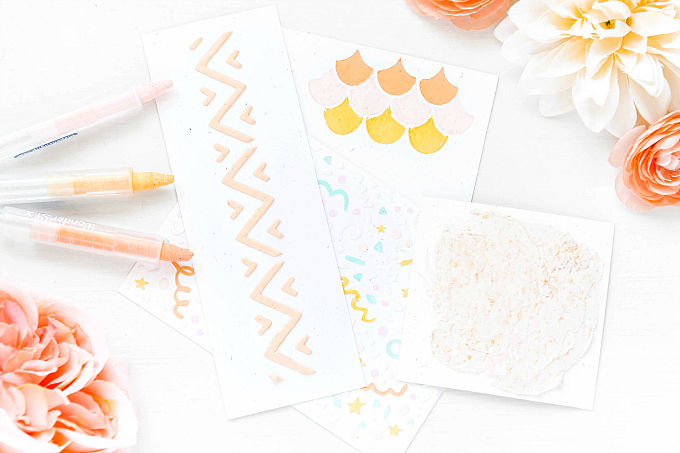 It involves die-cuts, vellum and double-embossing, so let's get started! I have been drawn to embossing quite a bit, and especially loving the layers that can be achieved with this technique. 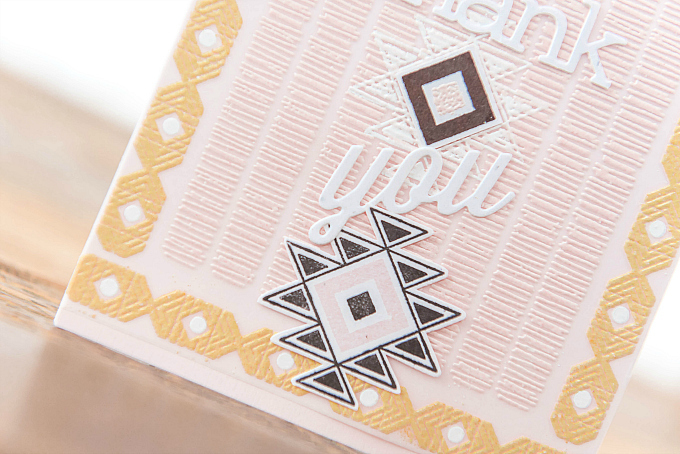 For some tips on layering with embossing, check out this post I did a while back. For this card, I used the same technique, to add many different textures and colors. I was inspired by a really beautiful Moroccan rug, and wanted to emulate the design and colors. 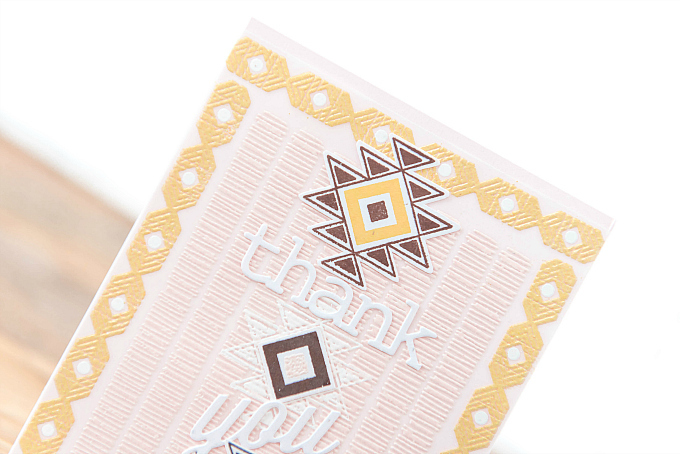 I used Papertrey Ink's Southwestern Style stamp which is no longer available, but I looove this set along with this set, for an awesome switch up. Or you could use this PTI set (but it's a last-call item, and will likely not be around for much longer). I stamped all of my borders on vellum, for some added layering, and used soft yellow and Blush Pearl embossing powder. To make the soft yellow, I mixed a tiny bit of Buttercup powder with White powder. 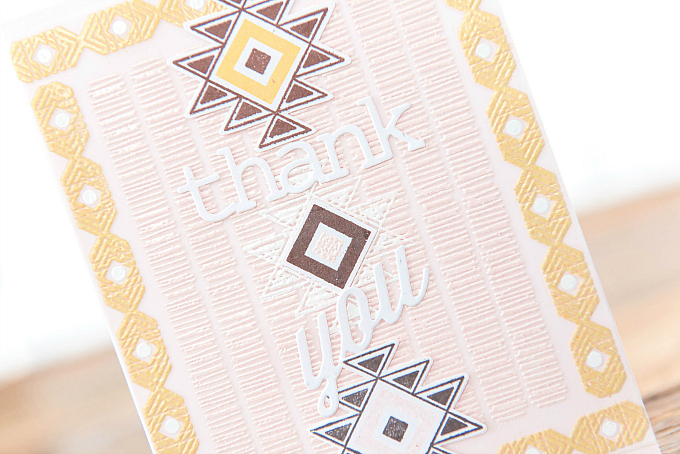 On the center motif, you'll notice I layered white embossing on top of the pink, and for the other two motifts I used a stamped and cut image. I used PTI's Dark Chocolate, Sweet Blush and Harvest Gold ink. I also added a die-cut sentiment using PTI's Wonderful Words: Thank You die. Once I finished all the embossing, and die-cut bits, I adhered the vellum onto some light pink cardstock. I love mixing these three types of layers! It gives a "single" layer card a bit more dimension. 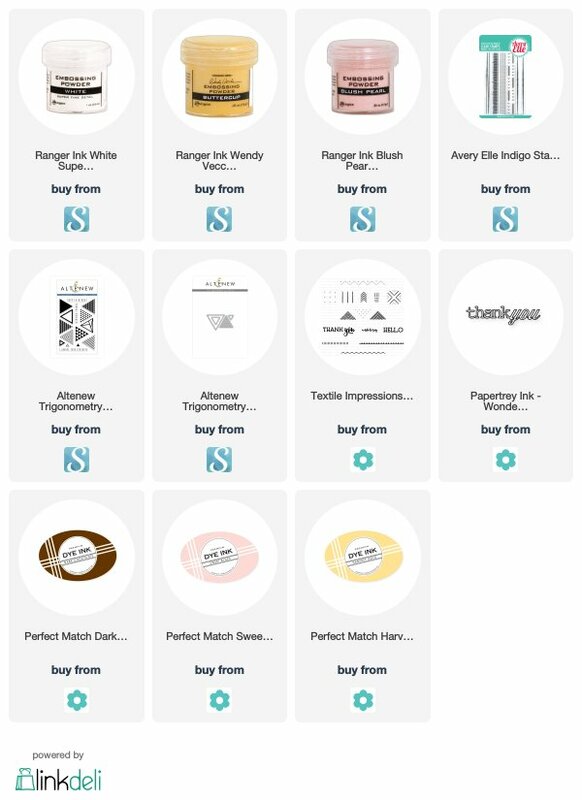 Ivana, I admit to having a tiny giggle when I read "...simple layering." Though, I might be able to pull this one off! Really pretty, gorgeous colors... and I always love to see what is possible with these geometric sets! Cool, modern looking card, Ivana!